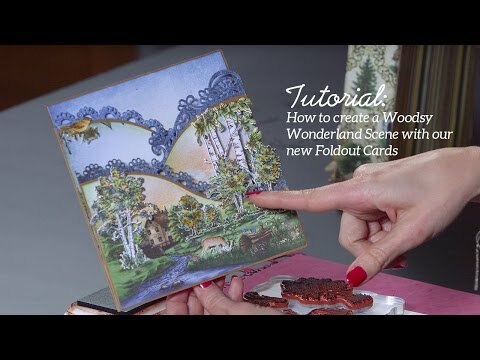 For more tips on creating with the Woodsy Wonderland collection, watch the tutorial at https://youtu.be/TldMdgGbYkQ. For more tips on creating with the Wildwood Cottage collection, watch the tutorial at https://youtu.be/g8WLXE8hLRk. Instructions: Cut a piece of cream cardstock 12" x 6", score at 6" along the long side and fold to create a 6" x 6" card base. Cut a 6" x 6" panel from the paper collection. Using the plain edge die from the Classic Border Basics die set die cut the top of the paper as shown. Adhere the top to the card base and add Crystal Ultrafine glitter to the images on the paper with Dries Clear glue. Using the largest plain edge die from the HCD1-7154 Eyelet Circle & Basics - Small die cut the circle in the bottom half of the panel. Die cut a frame from green cardstock using the eyelet die and the largest plain edge die and adhere to the edge of the circle. Die cut an eyelet edge from the green cardstock and adhere to the top of the panel. Adhere this to the card base using foam tape. Die cut an image from the paper collection featuring a sunset and some trees using the largest plain edge die and adhere to the centre of the circle. Add Lion's Mane Ultrafine Glitter to the tree images and add some dots of glitter to the sunset using Dries Clear Glue. Die cut the outer shield edge in green cardstock from the HCD1-7203 Ornamental Tag Die set. Stamp the Father's Day image from the HCPC-3846 Thank You Sentiments stamp set in Jet Black ink on a small patterned panel from the paper collection. Die cut with the smaller shield die and adhere onto the card as shown with foam tape. Add Crystal Ultrafine glitter to the images on the shield. Stamp the deer images from the HCPC-3768 Woodsy Critters Stamp set in Jet Black on Bristol Smooth cardstock. Colour with the Zig Clean Colour Brush Markers and die cut with the coordinating die. Shape lightly and adhere to the right side at the base of the circle with foam tape. Stamp the tree image from the HCPC-3766 Woodsy Treescape Stamp set in Jet Black ink on Bristol Smooth cardstock. Colour with the Zig Clean Colour Brush Markers and die cut with the coordinating die. Shape lightly and adhere to left side of the circle. Add Lion's Mane glitter to the tree with Dries Clear glue. Stamp two large tree images from the HCPC-3766 Woodsy Treescape Stamp set in Jet Black ink on Bristol Smooth cardstock. Colour with the Zig Clean Colour Brush Markers and die cut with the coordinating die. Adhere to each side of the circle as shown. Stamp the leaves from HCPC-3766 Woodsy Treescape Stamp set in Jet Black ink on Bristol Smooth cardstock. Colour with the Zig Clean Colour Brush Markers and die cut with the coordinating die. Shape and adhere to the top of the trees. Stamp the flower images from the HCPC-3767 Woodsy Wonderland Stamp set set in Jet Black ink on Bristol Smooth cardstock. Colour with the Zig Clean Colour Brush Markers and die cut with the coordinating die. Trim the lavenders and adhere to the base of the tree on the left side. Add Crystal Ultrafine glitter to the lavenders. Trim the red flower and adhere to the base of the right side tree. Add Crystal Ultrafine and Lion's Mane glitter to the flowers. Stamp the log image from the HCPC-3767 Woodsy Wonderland Stamp set in Jet Black ink on Bristol Smooth cardstock. Colour with the Zig Clean Colour Brush Markers and die cut with the coordinating die. Die cut another two dies from plain cardstock and adhere together with the painted image to create some strength. Adhere the image to the front of the card as shown with foam tape. Stamp the rabbit, squirrel, birds and cardinals from the HCPC-3768 Woodsy Critters Stamp set on Bristol Smooth cardstock and colour in with Zig Clean Colour Brush markers and die cut with the coordinating dies. Shape the animals and birds and adhere to the card as shown. Stamp the images from the HCPC-3769 Wildwood Florals Stamp set in Pearlescent Orange and colour with Canteloupe ink before die cutting with the coordinating die. Shape using the Deluxe Flower Shaping kit and add Crystal Clear glitter using Dries Clear glue on a damp sponge. Add gold party balls to the centres and adhere on the trees as shown.